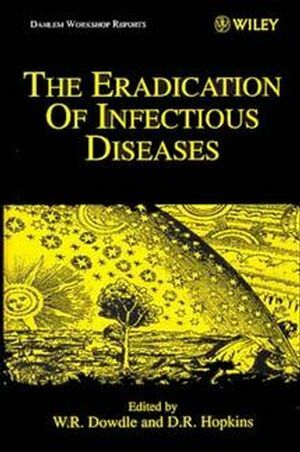 W. R. Dowdle is the editor of The Eradication of Infectious Diseases, published by Wiley. Donald R. Hopkins is a Bahamian American physician, a MacArthur Fellow and is the Vice President and Director of Health Programs at The Carter Center. Lessons from Previous Eradication Programs (A. Hinman D. Hopkins). The Role of Mathematical Models in Eradication of Infectious Disease (G. Medley, et al.). Group Report: How Is Eradication to Be Defined and What Are the Biological Criteria? (E. Ottesen, et al.). Disease Eradication Initiatives and General Health Services: Ensuring Common Principles Lead to Mutual Benefits (R. Aylward, et al.). Economic Appraisal of Eradication Programs: The Question of Infinite Benefits ( A. Acharya C. Murray). An Economic Perspective on Programs Proposed for Eradication of Infectious Diseases (M. Gyldmark A. Alban). Group Report: What Are the Criteria for Estimating the Costs and Benefits of Disease Eradication? Roles for Public and Private Sectors in Eradication Programs (C. de Quadros, et al.). Overcoming Political and Cultural Barriers to Disease Eradication (S. Foster). Advantages and Disadvantages of Concurrent Eradication Programs (S. Cochi, et al.). Designing Eradication Programs to Strengthen Primary Health Care (C. Taylor R. Waldman). Group Report: What Are the Societal and Political Criteria for Eradication? Are There Better Global Mechanisms for Formulating, Implementing, and Evaluating Eradication Programs? Thoughts on Organization for Disease Eradication (W. Foege). Group Report: When and How Should Eradication Programs Be Implemented?